Behind the scenes of Anina Rubio's journey to success. 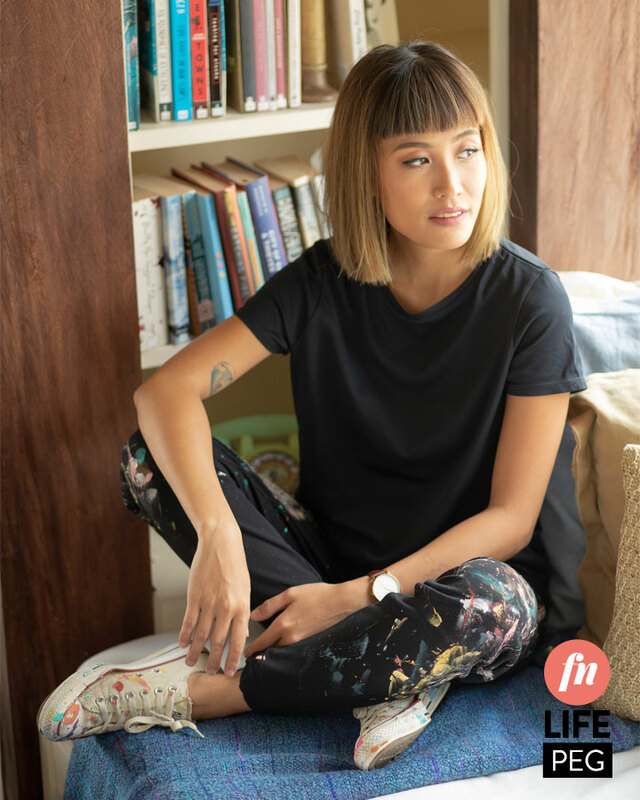 By all means, Pinay visual artist and muralist Anina Rubio, at 32, has made it. But looking at her career journey without rose-tinted glasses, it’s clear it wasn’t just talent that got her here, but her ability to recognize opportunities in uncharted territory. Success is a powerful motivator, but is it a worthy goal? Around the time Crazy Rich Asians was released—which was when we were finalizing details for this online cover story—I read a Constance Wu interview about her career and the decisions she had to make along the way. 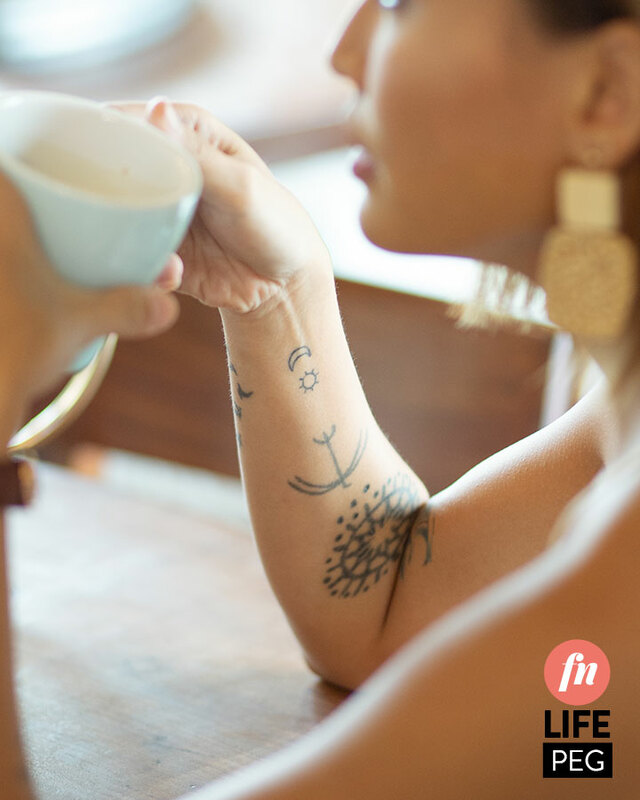 In the article, the actress (who sidelined as a waitress in between auditions) described how she made the decision to pursue acting on her own terms, "Are you okay if your life stays like this, where you're waiting tables, struggling to make ends meet? Are you still okay doing this when you're 45? I decided that I was." These were questions Anina Rubio asked herself multiple times in the course of seven years, to which she answered fully either with a career change or a new business endeavor each time. “I graduated with a degree in BS Electronics and Communications Engineering from De La Salle University in Manila and then I took the board exam as soon as I graduated. Fortunately, I passed, although I wasn't really able to use it or practice an actual engineering job,” Anina shares during her cover shoot for Female Network. 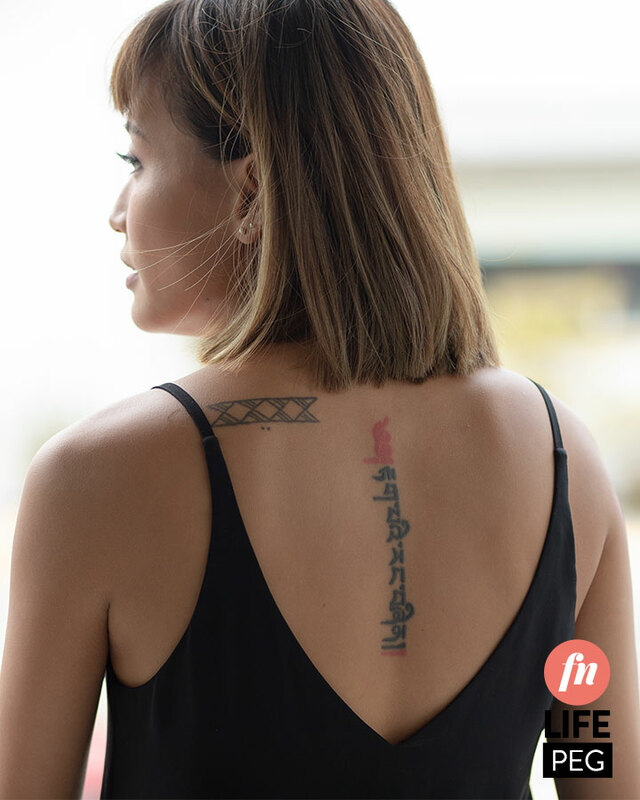 The popular muralist reveals that when she graduated, a telecommunications company got her right away to be part of their management training program for the IT side of the network. She stayed with the company for over three years, attributing her tenure to the fun company culture (“It was like an extension of college!”) and her sizeable salary. It was a luxury being in her early twenties could afford. And this decision, along with a properly timed opportunity and her love for nature, led Anina to an unlikely path. “When I quit my job, I just invested in organic farming. It was a complete detox. “I had chickens, free range pigs… ducks, rabbits, goats. I had vegetables… It was super different from what I've ben doing for the past three and a half years. It wasn’t a big operation, though; her clients were mostly friends and immediate relatives. Eventually, somebody bought the farm, and it was on to her next adventure. Deciding to get back into the corporate game, Anina then worked for Team Manila, a graphic design studio that needed a brand manager for their Lomography division. She also kept herself busy by starting an online fashion store and helping out in the family business. “But then, after being in a farm for more than a year, I [realized I couldn’t] go back to a corporate setup... There was always this thirst to travel. During that time, it wasn't super affordable yet, so I'd always make sure to do road trips...” She calls this phase her pre-calling, because little did she know, her curiosity would soon set her on the path to commercial and personal success. While she was busy juggling multiple jobs, Anina started using her personal time to pick up a new hobby. Nothing but her curiosity and an amateur love for painting got her started on calligraphy, but it turned out to be the most fruitful exploration of her professional life. “So I started doing calligraphy first. And then I would search for calligraphy workshops in the Philippines, but I think there was only one person teaching and ‘yong classes niya parang once in six months, super rare. “So I quit my office job, [but] I was still doing my online store and managing the family business also. I was technically multi-tasking. I found myself working a nine-to-six job, but then I would go home and at 7 p.m. after dinner until like 4 a.m., I would find myself just writing. “And then eventually—I think it was a matter of timing also because there was a growing movement for handmade, handwritten stuff—since I took a class, and I was confident enough to teach, I just took a leap of faith. Literally, I just posted on my Instagram na I have a workshop... sign up through this link... and then I was surprised I had [over 20] students who trusted in me. Anina started with calligraphy in 2014, watercolor in 2015, and murals in 2016. "Every year, I want to learn something new," she says. Interestingly, Instagram was one of the major platforms that helped grow Anina’s career path as a visual artist. But as with any tool, it wasn’t enough that she simply used it. She took the time and effort to curate it to be a proper reflection of her skills and personality. And that was what caught the attention of many brands that she still works with today. This collaboration paved the way for even more commercial work to start trickling in. But as with Anina’s thirst for exploration, becoming a pro calligrapher wasn’t enough. Her restless nature pushed her to expand to watercoloring in 2015. “Again, ganoon ulit 'yong process eh. Books, YouTube videos, online classes, then workshop here, and then I just kept on practicing and [eventually] started teaching that. And then from letters, naging flowers. “To be honest, I don’t like receiving flowers, but I challenged myself [to paint] something I don't like. [I mean], I love nature so much but I don't like picking flowers. I like it organic, planted... so I started painting flowers. And from there it evolved." In the beginning of her career, Anina shares she kept trying to perfect letters and shapes. But slowly, she came to embrace her own handwriting, and eventually injected more of her personality into her work. This impulse to take on new ventures head on seems to be Anina’s signature move. 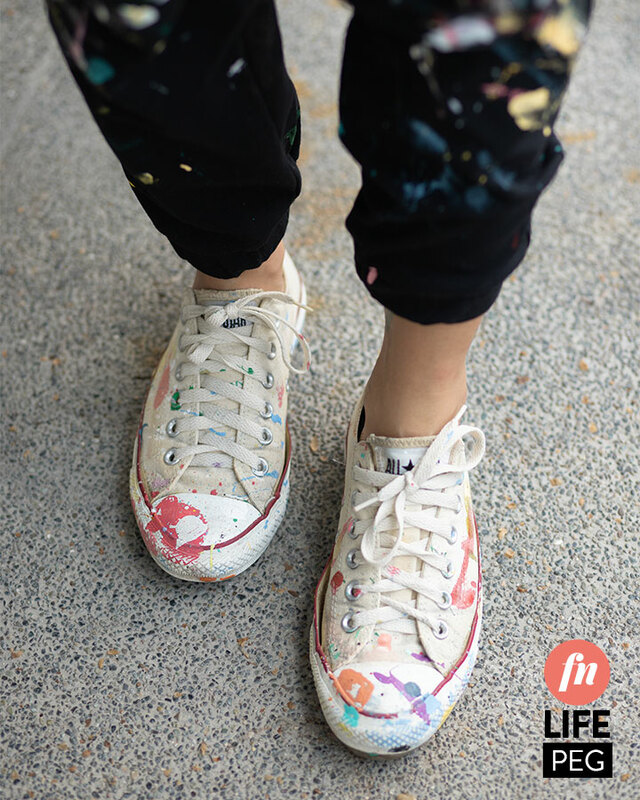 So much so that even her first try at mural painting under her apprenticeship with Argentinian artist Francisco Diaz forced her to face more than just one fear. “I'm afraid of heights... and my first ever wall was 50 meters wide, nine floors high, so I had to fake it ‘til I made it,” Anina says with a laugh. “After that first wall, I told myself, I want to do this. I can do walls now, and I want to keep doing it.” So she did. Clearly a genius at maximizing her skill set, the 32-year-old artist knows that to keep doing what she wants for a living, her work doesn’t end when her paintings do. She shares that over time, she realized that “eventually, everything that you do pala in life has a purpose talaga. “When I was doing brand management, I had to face clients, face people, attend events. So in the same manner, as a freelance artist, I feel that if I don't go out or put my work out there, nothing's going to happen. 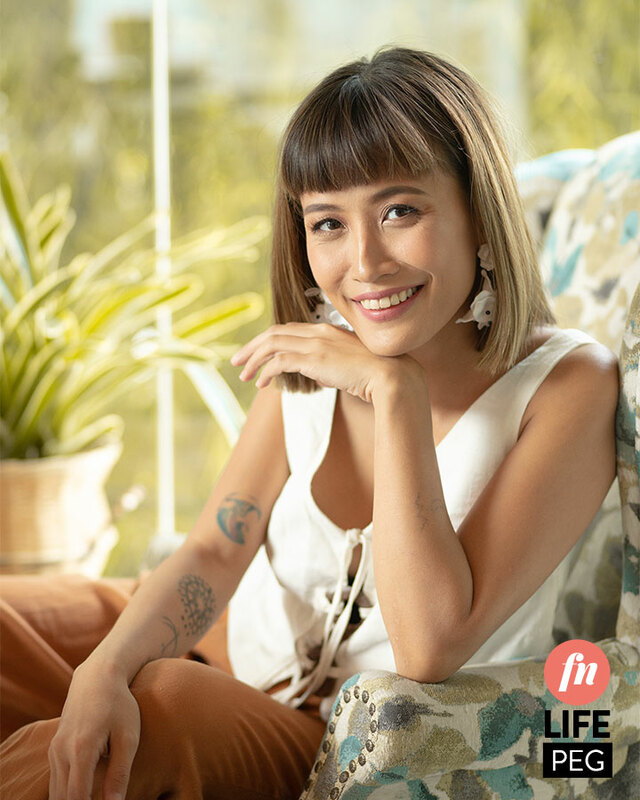 With her growing fanbase and client list, Anina knows it’s up to her to continue to be a relevant presence in the local art scene. And the only way to do that is to keep growing. She even invested in a unit where she can work freely and get in the zone, “para ma-pressure ako,” she adds. To put it bluntly, freelancing isn’t for everyone, but as Anina has proven, as long as you seek out opportunities instead of waiting for them to happen, stability isn’t impossible to achieve. “Kailangan mo siyang panindigan eh. Gagawan at gagawan mo siya ng paraan. Hindi puwedeng, 'Ah gusto ko lang mag-calligraphy' tapos nasa bahay lang ako. So I had to put my work out there. it wasn't fast pero gagawan mo siya talaga ng way. “To be honest, hindi siya madali—wala namang madaling trabaho eh. For me, nagkataon lang na now, I'm enjoying what I do. But then it doesn't mean that I will not work. It may look easy for people who think you’re just painting, but if you're the one trying to do it, mahirap siya. You have to have grit and you have to have courage [to fail]. Today, Anina has taken a break from teaching to focus on her next chapter: installation art made with sustainable materials. I’d ask her how she got there, but based on her history of self-learning and strong commitment to nature, I think I already know the answer. Besides, the bigger question to ask, as I learned from her, is why. And I can’t wait to see what she’ll come up with to find out.